Alex and Ivan said ‘I do’ at Worcestershire’s Curradine Barns. With a July wedding date, fabulous bright colours, fifties style and great entertainment, it was truly a summer delight. Alex and Ivan had their heart set on a barn venue for their summer wedding. As soon as they came across Curradine Barns, they knew it was the place for them. 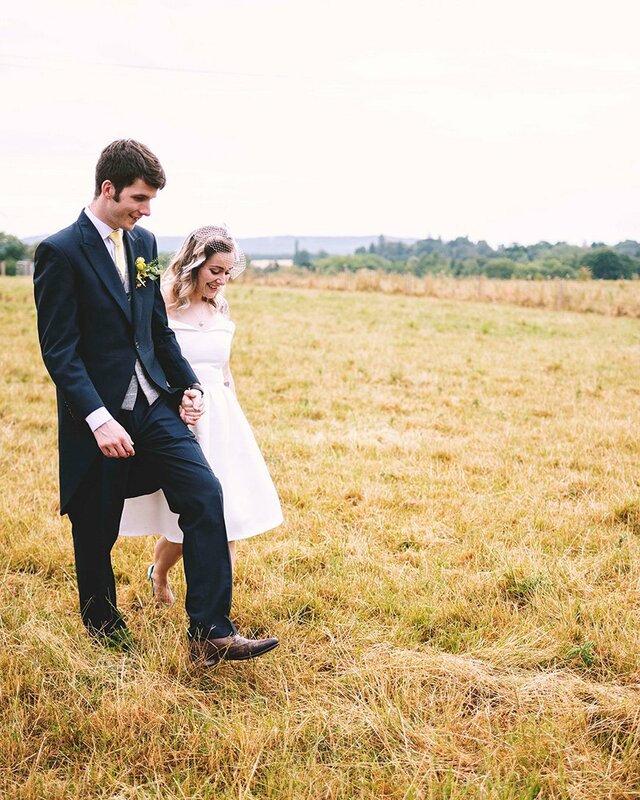 Alex’s fabulous wedding shoes proved to be the inspiration when it came to styling the day. With a 50’s theme, the main colour was yellow. Jam jars filled with daisies and other wild flowers adorned the venue alongside hearts decorated with paper flowers. The beautiful bride wore a dress from Chi Chi London, found online for a very reasonable price. She completed the look with elegant, sentimental jewellery and a bird cage veil, along with her show-stopping shoes. Ivan looked the part in navy tails with a grey waistcoat and yellow tie with white polka dots. Meanwhile, the bridesmaids wore yellow polka dot 1950’s style swing dresses, with white sandals and daisy stud earrings. 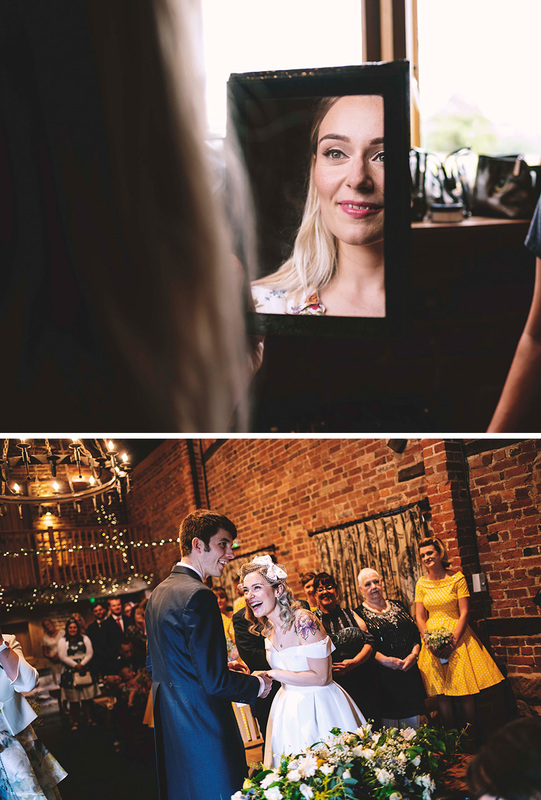 Following their romantic ceremony in the Granary Barn, welcome drinks and canapés were served in the bar and Courtyard while a close-up magician delighted the guests. Moving in to dine, the starter was a sharing board with cheeses, cold meats, olives, artichokes and other antipasti. “We liked the idea of sharing – there was bound to be something on there that everyone liked!” smiles Alex. A lemon sorbet was served as a palate cleanser before a main course sharing board with chicken and different sides and, for pudding, a trio of desserts. After the sun went down, the newlyweds danced their first dance to ‘I Wanna Be Yours’ by The Arctic Monkeys and a live band filled the dance floor. Wood-fired pizza from the Curradine Cantina was a wonderful choice for evening dining on this summer evening.